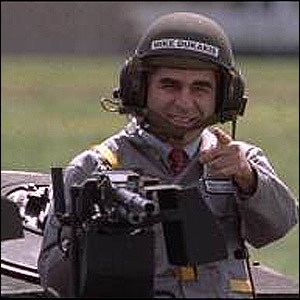 Remember Michael Dukakis? You know, former Massachusetts governor? The tank photo you see to the right? Ran for president in 1988? In case no one still remembers, raid a game of Trivial Pursuit, he's probably in there somewhere. Anyway, university student Michael Bendetson  has scored an interview with him and printed it at the Huffington Post . And, this momentous event allows us to introduce the first episode of "Spot the Mindless Recitation of Massive Immigration Talking Points". How many can you spot in the following reply Dukakis gave to a question about immigration? "I understand anti-immigrant sentiment. We have always had it. Very often, the last generation of immigrants is the one objecting to new immigration. I think if we are going to limit immigration in the United States, current laws need to be enforced. I am not mad at people that are anti-immigration, but I do keep reminding people that the vast majority of people in this country came here as immigrants. We are experiencing a new wave of immigration, mostly from south of the boarder. The reasons are obvious to anyone; economic need is economic need. People come to this country to seek the same opportunities that my Greek parents sought. The current situation is not acceptable. We are not sending 12 million people back. The question is how do we fashion an acceptable alternative. I am not proponent of amnesty, but I would support some type of earned citizenship. However, the key is enforcing the laws that are already on the book." "currently attends Tufts University and writes for both the Tufts Daily and huffingtonpost.com. His works have appeared on MSNBC’s Countdown with Keith Olbermann, cbsnews.com, and politico.com. He is known for his fair and unbiased interviews with such notable political figures as Joe The Plumber, Barney Frank, Bob Dole, and Ron Paul". A real zero. Even brings up the 'nation of immigrants' crap. As if there's no such thing as an American. Good riddance. I think this pig will say anything he is told to say. this pig Dukakis is so owned by the third world drug dealers it's a joke. in fact like the so called U.S. Government and all its people are in fact owned by others and it is a joke on any who are Americans. "I understand anti-immigrant sentiment." No, not anti-immigrant, anti-illegal alien. "The question is how do we fashion an acceptable alternative." He answered his own question twice as to what the 'acceptable alternative' is. The same acceptable and untried alternative, the same empty promise that 80 percent of Americans have been waiting for, for the last 30 years. "current laws need to be enforced." and "However, the key is enforcing the laws that are already on the book." Hey, Dukakis...are you even listening to yourself? Enforcing current laws IS key. And it clearly states deportation IS the law. It states NO benefits and NO jobs for illegals. None. It calls for building a fence. A real one, not a virtual one. It calls for arresting employers and those who aid and abet. If we ever started enforcing our current laws, half of those 'twelve million' would be gone in a year. And half of congress, half of the border states legislators, mayors and governors would be behind bars. So how soon can we start? A blessed Memorial day wish to the men and women, and the families behind them, all who paid the price for our nations security, sovereignty and for keeping our borders secure from invasion. To consider granting the rewards of amnesty and a path to citizenship to those they defended us from dishonors their memory. It is not an 'acceptable alternative'. Good for you Edward, but the Nation and its political/economic and militsry secuity was toss out the door many years ago and our sovereignth has become a world joke. The system has started to dismanlte the USA And the NEXT stop on this evil road maybe 20 or 40 years down the line but it will come with the death or a nation of freedom. "Oh sure the flag will still be up", but within 50 or 60 years it will only be a joke and a third world hell is well on its way and with that go have fun kids. The problem with Dukakis assertion of an "earned citizenship", is that it could not be applied equally to all who would become immigrants and according to the law and prudent social policy. We'd first have to open our borders to everyone, including the uneducated, the chronically ill and any others who would be prone to becoming dependent upon the national welfare system. Dukakis is just another liberal socialist who would act against the best interests of those who are already citizens by transferring our national wealth to the rest of the world. I would add one more talking point: mentioning immigrant parents or grandparents as an 'argument' for continuing immigration forever. It makes no sense, but it's so frequently used as an appeal to some kind of sentimentality, that few people will object to it. After all, it would be so mean and unfair to stop immigration when earlier immigrants (like Dukakis's family or Kennedy's family, etc.) came here poor and looking for a better life, etc. And what's wrong with objecting to immigration per se? So often I hear conservatives saying ''I don't oppose immigration, just illegal immigration.'' Yes, but how much immigration is enough? And what if Congress suddenly approved much, much higher levels of legal immigration, so that we continue to get millions more new immigrants each year? Do we even have jobs for the millions who come here now? Obviously the answer is no. Where is it written that we have to welcome immigrants in perpetuity? Our Founders never envisioned that, and it's not written in stone that we should do so. So yes, Mr. Dukakis, some of us oppose more immigration, period, simply out of common sense. We have unknown numbers of illegals, plus a million and a half legal immigrants each year. Why on earth would more be a good thing? This country is already lost...the demographics and baby boom of single, welfare dependant hispanic squatters has doomed us...Third World here we come! Mary you see the light and the next move is to take what we can from our enemies here and make a place for our kids to live without third world fear. but don't think that people of right against people of evil will fight back and way to many have been sold a PC World of words and self-hate. As things worsen my hope is common sense thinkers and patriots will throw the PC crap out the window and see it for what it is. It is the abandonment of principles and morality. Someone tell me, how does one reconcile both diversity And a melting pot? They represent cross purposes.I'm sick of white americans getting the short end of the stick, and the emphasis on race. The only reason they emphasize race is to create a contriversy for their political power. They want the seperation to continue....they need constant victims for their agenda. Now they will import them as needed. Mary no principles and ideals of right and life can be found inside a dead system of non political ideals. This nation died after world war two of self-hate it was sold a bill of goods by people who hated freedoms the civil rights BS Was just a cover to take down freedom for all of us and fact facts it died of just meanness and that was the goal of our enemies and it worked.